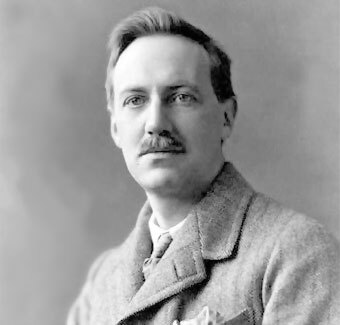 Edward John Moreton Drax (1878–1957), 18th Baron Dunsany, published under the name Lord Dunsany some of the most original and imaginative works of fantasy in the earlier part of the twentieth century. He was not a best-seller in his own lifetime, but the publication in paperback of five books between 1969 and 1974, in Ballantine’ Adult Fantasy series, brought him to a new and large audience. These reprints were his novel The King of Elfland’s Daughter, and the short stories gathered in At the Edge of the World, Don Rodriguez: Chronicles of Shadow Valley, Beyond the Fields We Know and Over the Hills and Far Away. In 2008 a delightful film was made of his largely forgotten book My Talks with Dean Spanley (1936) starring Jeremy Northam and Peter O’Toole, and with Sam Neill as Dean Spanley. And then one day imagination came to the rescue and I made unto myself gods, and having made gods I had to make people to worship them and cities for them to live in and kings to rule over them, and there had to be names for the kings and the cities and great plausible names for the huge rivers that I saw sweeping down through kingdoms by night (quoted Amory 17). After Eton, he went to the Royal Military Academy at Sandhurst, and became a lieutenant in the Coldstream Guards. He fought in the Boer War. “You were damned bad shots,” he told an Afrikaaner later. “We were not,” the Akrikaaner replied. “I wouldn’t be alive if you weren’t” (quoted Amory 27). However, his father died in 1899, and he inherited the title; in 1901 he left the army and settled at Dunsany Castle in Co. Meath, about twenty miles north-west of Dublin. He was not particularly interested in farming, but he loved hunting, and dogs: he campaigned against the cruelty of docking dog’s tails. He married Lady Beatrice Villiers, the daughter of the Earl and Countess of Jersey, in 1904, and had one son. In 1905 he began publishing short stories, mostly set in orientalist fantasy worlds, with cruel gods and bizarre customs: The Gods of Pegana (1905) was his first collection. He also wrote plays, which were produced to some acclaim in Britain and America. After his war service he returned to Dunsany Castle. He continued to shoot, despite the dangers of carrying weapons during the Irish War of Independence: in January 1921 The Black and Tans came to Dunsany Castle and removed all the guns, even the purely decorative ones on the walls, and he was fined £25 for possession of arms. “I’m snaring eels now, like a reformed drunk drinking soda-water” (quoted Amory 181). He was a fervent unionist, and regarded the Anglo-Irish treaty as a betrayal. Luckily, he was regarded as a good landlord, and his estate steward was a good Nationalist, and so he avoided the fate suffered by many of the Anglo-Irish landowners of being burnt out of his own house. He had financial problems after the war, and to supplement his income he went on lecture tours in America, wrote novels, took up portrait painting, and wrote radio plays for the BBC. He was offered associate membership of the new Irish Academy of Letters in 1931: he was ineligible for full membership as he did not write about Ireland. Dunsany immediately wrote four novels about Ireland. His most profitable creation, and certainly the liveliest, was Jorkens, who saw the light of day in 1925: Jorkens was a Baron Münchausen, who told tall tales in his club, enabling Dunsany to exploit some of his own travelling memories in India and Africa. Jorkens knew people whose tales were even more extravagant than his own: one of his friends flew to Mars on only fifteen gallons of petrol. There were over a hundred Jorkens stories, gathered together in five volumes, beginning with The Travel Tales of Mr Joseph Jorkens (1931); subsequent volumes were published in 1934, 1940, 1948 and 1954. Dunsany detested the new regime in Ireland, after Independence, and in particular objected to Irish neutrality. In 1940, after the Fall of France, he left Ireland to live in Kent. He was given the title of Byron Professor of English Literature at Athens University by the British Council in September 1940, and arrived there to take up his position there in January 1941, a few weeks before the German Army arrived to take up theirs. He did go back to Ireland for some years, and did some lecturing in Trinity College Dublin. In A Glimpse from the Watch Tower (1945), he commented on the news of Hiroshima: “I think a new era started yesterday … henceforth we are all people with a mission, a strange mission, not to destroy the world” (quoted Amory, 271). In 1947 Dunsany gave over his Irish estates to his son Randall, and went to live in Kent, and usually thereafter only went over to Ireland for the shooting. He wrote three volumes of autobiography: Patches of Sunlight (1938), While the Sirens Slept (1944), and The Sirens Sake (1945). He went to Dunsany Castle for the shooting in October 1957, and fell ill; he died in a Dublin nursing home on October 25, of appendicitis. Before the operation, from which he never regained consciousness, he wrote, to the last protesting about Ireland’s neutrality during the Second World War: “I want to be buried in Kent in the Churchyard of Shoreham so as to share with every one of my neighbours whatever may be coming, when dead, as I shared it through the summer of 1940, when alive” (quoted Amory 282). Most of this information comes from Patrick Maume in the Dictionary of Irish Biography, supplemented by Leonard R.N. Ashley’s entry in the Oxford Dictionary of National Biography and by Mark Amory, Biography of Lord Dunsany (London: Collins, 1972).